During my time at SmartPak I have seen how our great customer service and care for other people and animals reaches far beyond serving customers. The genuine care and concern expressed by every member of the SmartPak family can be seen in our everyday interactions with each other, with our customers, but most of all in the many philanthropic causes SmartPak kindly supports. Although my time here at SmartPak is still yet to reach the one year mark I can honestly say that I have never had the honor of being with a company that is as generous and caring as SmartPak continually proves itself to be. My time spent working with the Coalition has been wonderful. I wish they all knew about horses and could join our team here! The people who work there are an inspiration through their genuine concern and interest in the well being of anyone who crosses their path. All of this combined just reaffirmed the notion that this was the perfect organization for SmartPak to partner with. For the month of November we set up 5 beautifully decorated collection boxes around the company. We were fortunate enough to have these boxes designed by the talented members of our own Social Committee and Spirit Squad. It was such a joy coming in every day seeing the boxes become fuller and fuller with everyone’s generous donations. 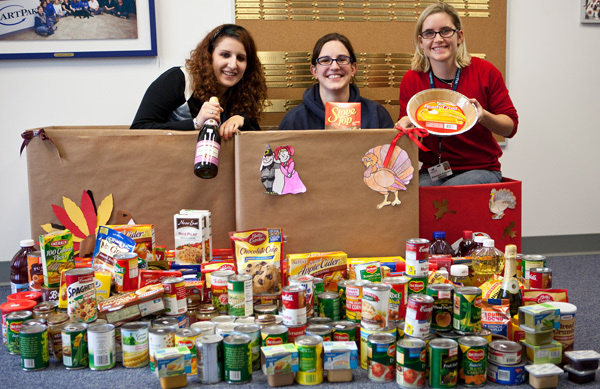 With the Coalition’s wonderful open door policy we have been able to make multiple drop offs of everything ranging from more StoveTop stuffing than I’ve ever seen in one place, to a pie crusts, champagne bottles of sparkling juices, and even a whole turkey among many many other items! All in all our donations topped out at over 100 cans, over 100 boxes, and approximately 100 other various food items. The donations included everything you could imagine seeing on your own family’s Thanksgiving Day dinner table and then some. The generosity of the SmartPak family has been amazing and awe inspiring. The best has been dropping off the food and seeing the thankful faces of the people working at the Coalition as we’re carrying in bag after bag of Thanksgiving feasts. I look forward to continuing our work with the Coalition with a Christmas drive for clothes, furniture, books, toys, and any other items people are willing to donate. This has been an amazing experience and I can only expect to have similar success in the future! The SmartPak Runners Club has really been starting to come together in the last couple of weeks, and I, for one, couldn’t be happier. It’s really true that having someone else to run and work out with really does help motivate you. And sometimes, I need some serious motivation! Take this Saturday, for example. I’d been looking forward to the race all week. Had a great 3-mile lunch run on Thursday and another brisk, but chilly, Friday morning run. Then I came home Friday night to find that our furnace had decided to take the day off and wasn’t planning to work that night either. The repairman couldn’t come out until Saturday afternoon, so I bundled up and called it a night. If you think waking up at 7 AM on a Saturday to go running sounds less than inviting, imagine doing so when it’s 48 degrees INSIDE your house! Fortunately, I’d seen this coming, so I’d stowed my running clothes under the covers with me the night before. After literally getting dressed in bed, I waited until the last possible second to throw back the covers and head for the car. Once I got to the race, I was too excited to care about the cold. I think the same was true for Liz, my fellow SmartPak-er, from our Marketing Department, though this was definitely not the case for her husband, Bryan. (In fairness, Liz and I have both been up much earlier in much colder weather on countless horse show mornings!) (Plus, Bryan’s not an avid runner, just a very supportive husband, so it was a little harder for him to get excited about the race.) We registered and got our swag and started to get lined up. The whole event was really well organized and the volunteers couldn’t have been nicer. It was going to be a great day. Surrounded by runners of all ages, including some in strollers, and more than a few dogs, we set out. Our pace was good, though we probably could’ve pushed harder if we hadn’t been so busy making movie references and swapping jokes. But hey, if it’s worth doing, it’s worth having fun, right?! All told we were thrilled to be a part of the 800+ runners who came out to get some exercise and support a great cause. A huge thank you is owed to the Soul Sisters Foundation for organizing such a great event for such an important cause – race proceeds went to the Dana Farber Cancer Institute in Boston. Want to hear more about the SmartPak Runners Club? Check out our blog on the Cause 4 Paws Dog Walk and 5K Run.